Amber Parry Strong, of Island Bay (Kids Friendly) Presbyterian Church shared this resource she wrote for the families of her community. It is a good guide from a mum obviously committed to sharing her love of the bible with her and all children. We hope you find it helpful. Kids Friendly Advisor, Cheryl Harray, encourages churches to recommend this Bible to parents so they can simply read a chapter a day- at teatime, bedtime, breakfast- whatever works best. She has also used it very effectively in an all age service where everyone from youngest to eldest were attentive to the simple words of truth and hope. Kaila Pettigrove: “We received a Bible for Christmas and I want to recommend it! It’s called The Jesus Storybook Bible. It’s a paraphrase version, but it’s done with such love and sensitivity! My seven-year-old commented that, “This Bible is great for children of ALL ages because it explains the WHOLE Bible in a way that is very easy to understand.” She’s right! It doesn’t just give a paraphrased version of a few selected stories, but it starts from the beginning and puts everything into the context of Jesus sent to us because God loved us! My 4-year-old son often squiggles in his seat as we have our family devotions. Tonight as my husband read aloud from the introduction and then the first story, he sat mesmerized with his mouth half-way open! I really should’ve asked HIM to write this review! You can order The Jesus Storybook Bible by downloading the order form and emailing it to orders@biblesociety.org.nz or fax it to (04) 805 0134, or phone 0800 424 253. Special discounted prices are available on orders of 10+ or more. The curriculum is designed to work alongside the Bible and aims to teach ‘the Story beneath all the stories in the Bible’. I cannot recommend this curriculum highly enough. Too often, our children’s programmes are so geared at entertainment, or are so diluted of content, that the true message of what Christ has done is lost. This programme takes seriously God’s love, our sin, and that we need Jesus, our Saviour, to redeem us and our lost world. Judy Goroncy, Highgate Presbyterian. The Beginners Bible is an ideal first Bible for young children with over 90 favourite Bible stories coming to life through simple text and colourful, fun illustrations on every page. Many churches running preschool community outreaches (eg mainly music and playgroups) give a copy of this Bible to children as they ‘graduate.’ Other churches present parents with a copy when their child is baptised or at a service of thanksgiving/dedication. The text is also very easily adapted for simple plays and interactive stories. Try the Christmas story p266-281 with groups of people responding with a sound every time you read ‘angel’ (hallelujah- sung if possible) ‘baby’ (aahhh!) ‘shepherd/sheep’ (baaa!) EASY and fun with groups of children or all ages. I recommend this as a great gift for Godparents to give for baptisms, birthdays, or other special events when a Bible has already been given. Every church should invest in a really good children’s bible with great illustrations. Available from www.barnabasinchurches.org.uk . Launched by the Bible Society of NZ at the end of 2016 this Bible is a gift to all. This Bible will lead to the preservation of te Reo and the continuation of promoting the use of Maori language. For the Old Testament search for “Testament: Bible in Animation” on YouTube. Here is a link for the story of Joseph. These classic 20 minute films of the stories of Creation and Flood, Abraham, Moses, Joseph, Elijah, Saul & David, Daniel, Jonah and Ruth offer opportunities for introducing the stories in an engaging. They work equally well with younger and older children. They usually come in three parts so ask one of your clever young people to download and merge them so you can play it as one episode. Thank you God for young people! I love this idea posted in Building Faith. Such a creative way to explore bible stories with kids and all you need is a box of Lego and a phone and of course a bible! Why not try this during a holiday period and give your regular leaders a break. Ask other adults or teens to come and work with kids over three weeks to create a movie and then show them in church over the next 3 weeks. This is an amazing selection of FREE bible images- photo or illustration format- so easy to put into a Power Point, or print a story-teller’s copy of the day’s Bible story. The Maps show children where things actually took place! This resource offers Bible Story books to print free from songwriter Jill Kemp (NZ), Check out the Values series for early learning centres, Easter and Christmas booklets. Scroll right to the bottom for many FREE resources. TGhe website is a little tricky to navigate, but there is a WEALTH of free resources here from Jill Kemp. I’ve yet to meet anyone who doesn’t love Sally Lloyd-Jones’ wonderful “Jesus Storybook Bible”. At this year’s South Island I was gifted a Manna book voucher and to my delight found Sally’s latest book on their bookstand at the conference. 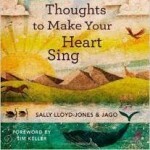 “Thoughts to Make Your Heart Sing”, is a beautifully illustrated book of devotions (and conversations) to share with your children. This is a favourite find from Cheryl Harray, Kids Friendly Advisor, Synod of Otago & Southland. Why not encourage your families to memorise one short memory verse a week during 2014?